Have you ever had a foster kitten or better yet, foster kittens? Would you like to help your local animal shelter or rescue? Spring and early summer is kitten season around the country and we’ve assembled a comprehensive list of 12 steps which will help any new cat foster be successful. These 12 steps to raise friendly foster kittens can help if you’re thinking about trying your hand at bringing on foster kitten in your home, or a family of cats. 1- Calm Transport. If you’re transporting a new foster kitten from a shelter or rescue to your home, keeping her calm in a carrier is the best. Place something soft inside like a small blanket so she’ll be comfy. Place a blanket or towel over the outside so you don’t stress her out with the movement. 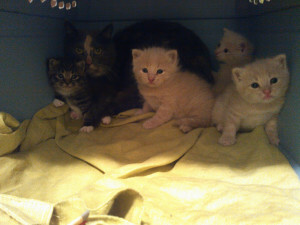 The feral mom and kittens in the picture below were comfy and safe in the carrier during transport. 2- Safe Surroundings. The room you’ll be keeping your foster kitten in should be free from dangerous chemicals or items that could hurt the kitty if they she were to climb on or get in. Ideally the walls to the room should be solid and not have any holes in the drywall or open windows. FYI: You might find it silly to think about this but believe me, people have been known to foster kittens in the most unsafe situations and accidents HAVE happened. If you’re keeping the momma and/or kittens in a crate, make sure the crate is secure and the kittens won’t be able to get stuck in between the wires. Note: If you’re leaving your momma and kittens in a room by themselves it’s a good idea to place them in the room with the crate/carrier door open and leave them be for a few hours. When they decompress they’ll come out and start investigating. 3- Age-Appropriate Food. Depending on the age of your foster kitten and if the momma is with her, you might need to bottle feed. Go to your local pet supply store and ask them about kitten milk replacer and buy the necessary supplies (syringe, eye dropper or bottle) then move on to other kitten food as she gets older. It’s important to feed the right food at the right stages for proper kitty development. Kittens can’t eat large pieces of cat food until their teeth are developed nor does the food have all the nutrients, vitamins and minerals they’ll need at that age. Kitten food is a necessity. The right kind of bowl is important as well. Most cats don’t like their whiskers to touch the sides of the bowl when they eat, especially if you’re feeding canned cat food. Shallow dishes and even small plates are good to place wet/canned cat food on. 4- Clean Water. Your foster kittens need fresh water in a shallow bowl or dish. We urge you to not use deep bowls because the babies can fall in them and drown. You’ll need to change their water frequently because they might drop food particles or cat litter in it. Place the water bowl on something that can absorb any spills will help. 5- Litter Boxes Sized Right. In a shelter environment, the cat cages are usually small so a large litter box is impossible to have. Now that they foster kittens are at your house and possibly the momma cat, purchase a larger litter box; they’ll all appreciate it! Kittens need litter pans that are lower so they can get in easily and they might not be able to climb over taller sided litter boxes. Additionally, we recommend having two litter boxes in the room, one larger for mom, one smaller for babies. 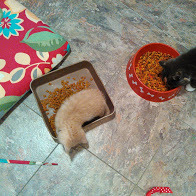 As the kittens grow, you can just purchase a larger litter box and put the smaller one aside. Also, keeping these litter boxes clean is important – we suggest you scoop the boxes several times each day. Your kittens will play in these boxes and will get in and hide from his siblings so keeping the waste cleaned regularly is important. Speaking of cat litter, we suggest you use the highest quality cat litter possible when the kittens are small. Their respiratory systems are delicate and many of the litters on the market are known for dispelling lots of dust as they scratch. We’re using scoopable Tidy Cat litter currently. 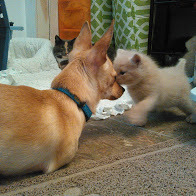 In the picture below, Sonny, my two-legged Chihuahua aka the Kitten Whisperer looks on as this foster kitten does his business. Sonny likes to clean the babies and sleep when them on occasion. He’s always monitored when he’s around the little ones and he’s become a huge asset in helping me socialize the kittens to dogs and ‘new things’. 6- Safe Touch. 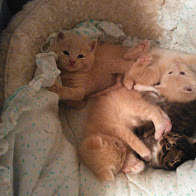 Depending on how the foster kittens were obtained, they could be from a feral or semi-feral momma cat or could be the friendliest kitty’s around. If the momma cat is shy, has huge pupils when you get near her, crouches down or runs and hides from you, she’s probably not used to human touch. Her kittens will likely follow in her footsteps unless you step in. Feral cats are hard to adopt so take the time to really work with them now. What I’ve found that works is to just sit on the floor and to just let the kittens explore when they’re ready. You can use canned cat food to lure mom to you. Take a spoon and put a small amount on it, put it near her nose and just go sit down. She’ll likely come over to grab a treat! I use a light touch at first then begin handling them once they relax. Ferals and semi-feral foster kittens require a ton of patience and might not ever seek human attention. However, provide calm human presence is important at this stage so she does learn that some humans aren’t scary. Be sure to pick them up, cuddle them, kiss and nuzzle them. Get them used to being handled in odd ways too. 7- Various Sounds. Placing a radio or tv in their room helps introduce the foster kitten to various sounds and they get exposure to something other than my voice. 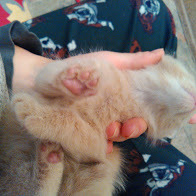 When I’m visiting the foster kittens, I’ll use my baby talk voice and talk softly to them. I’ll also raise my voice once in a while. In my experience, the kittens and mom spook and hide when I do this so it’s important to immediately coax them back to you for some fun play. In the shelter environment, they’d likely be exposed to dogs barking, cats meowing and dozens of people coming and going on a daily basis. You can replicate this by doing the things mentioned above. 8- Light Stimulation. If you have a window in the room, open the curtain and let the sun in so the momma and kittens can look outside. After a few weeks of being cooped up in the room, the momma cat will start getting antsy more than likely. Also with light stimulation I like to come in when it’s dark and turn the light on and off. I talk softly to them while doing this so they associate that with me coming in to visit. The kittens will probably get scared when you do this but comforting them and rewarding them when they walk back over to you is important. 9- Fun Toys. As the foster kittens grow, they’ll need toys to stimulate them. Toys with feather and bells work great and strings are a big hit once the kittens get to the point where they chase things. Put a small blanket on the floor they can roll around on and hide in. As they grow, provide things they can climb on, i.e. cat towers, scratching posts. 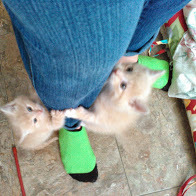 Wear thick pants when you go in to play with your foster kittens! 10- Cool Hiding Places. Provide empty boxes the kittens can jump on, run and hide in. Set things up in the room where they can play hide and seek. Make sure all furniture in the room is sturdy and can’t fall over on the foster kittens. 11- Positive Socialization. Socialization starts with you. You should be the best, kindest, most loving person in her life and introduce your foster kitten to other people who will be gentle and loving to her. If you have sibling kitties and have to keep your kittens in a crate/carrier/partitioned off from the rest of the house, take them out of their area frequently for short periods of time so they can explore a little. Just be sure that you keep your eye on them AT ALL TIMES because they could run and hide somewhere or accidentally run outside if someone opens a door. If you have other pets, especially dogs, do slow introductions. And please don’t introduce kittens to dogs that have high prey drive – that could be a disaster! Hold the kitten and let your dog smell but don’t put your kitten on the floor. Your dog could accidentally step on him or quickly bite and you might not have time to react. CAUTION: If you have a dog that has injured cats or small animals before, DO NOT introduce this dog to the foster kittens. Keep the kittens safe at all times. 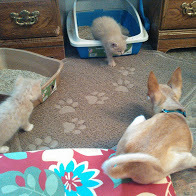 In the picture above, the kittens were introduced to Sonny first because I knew he’d be gentle with them. He’s been a great playmate the last couple of weeks and the kittens all flock to play when he comes to visit. 12- Health and Regular Veterinarian Check-ups. A veterinarian check-up is important to make sure they’re healthy and progressing nicely. Once they’re old enough, they’ll receive first round of vaccinations and an appointment to be spayed or neutered should be made before your kittens are adopted out. Before you take the kittens to the veterinarian, keep an eye on their ‘nose, eyes and rears’. Any crustiness or drainage in either the nose or eyes should be checked by a vet. Simple eye ointment or antibiotics might be prescribed. Momma usually keeps their rears clean, however, some new moms don’t have this instinct and you’ll have to help babies potty. Doing this is easy, just take a warm wash cloth and gently rub their rear end. You’ll notice them start to potty. Lift up the tail and show it to mom. Hopefully she’ll start to clean but if not, just keep doing this a few times a day and she’ll get the hang of it. Once they start having bowel movements, you’ll need to check their bottoms frequently. Be gently if you need to clean dried poo, use a warm rag and softly loosen the stool and show to mom – again, hopefully she’ll take over! In closing, we like to urge people to spay or neuter their foster kittens BEFORE they’re placed in a new home. 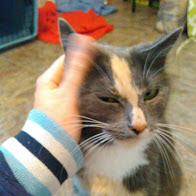 Doing this early prevents unwanted litters, keeps them healthier and allows them to be better inside kitties (less marking, spraying and fewer tendencies to roam outside). We recommend you take pictures of your foster kittens throughout their time with you. This helps people to see their personalities, shows how lovable they are and entices people to adopt. These pictures can be used for networking to help find them new homes. If you aren’t fostering for a shelter or rescue and are doing it on your own, we suggest you never give away the kittens for free. Always ask for an adoption fee and if possible do a home check and get referrals from their friends and veterinarian. 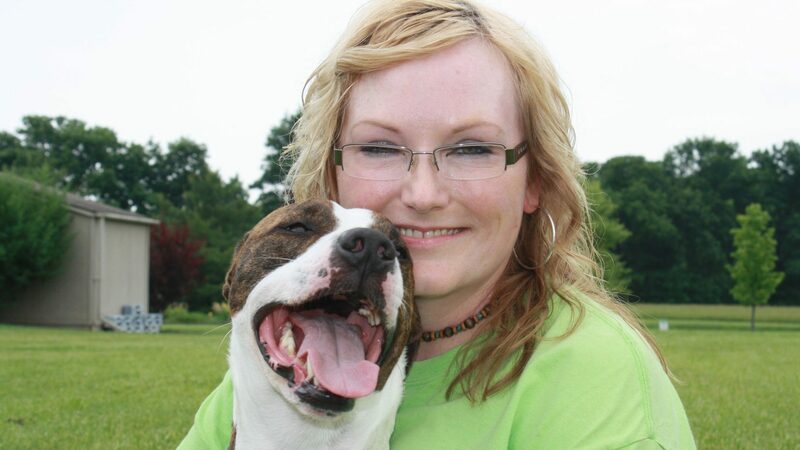 If you know this person hasn’t taken good care of their pets in the past, please don’t adopt to them. If you see this person on facebook begging for free animals, don’t adopt to them either. A kitten is a big commitment but the love you receive far outweighs the scratches and constant cleaning. Being owned by a cat is one of the greatest pleasures I’ve had in life. Remember, fostering is very important because you’re helping that kitten grow into a fantastic, lovable, outgoing and friendly baby for someone to spend their life with. 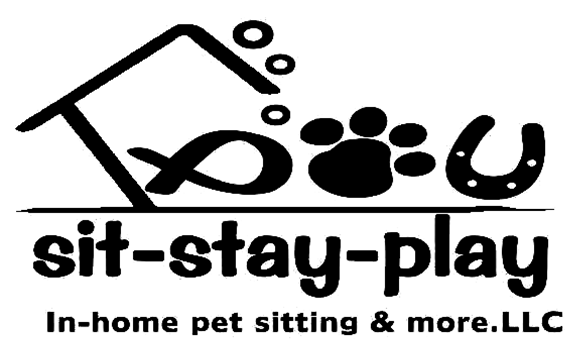 Lastly, should you need a cat sitter or pet sitter, we can help. We’re professional pet sitters and love kitties! P.S. If you have questions about fostering please call us at 765-744-5688. P.P.S. 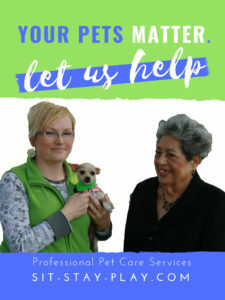 If you need a pet sitter or cat sitter and have foster pets, we have a foster program discount. Ask us about it!